An excellent experience overall!! I normally don’t take advantage of the included breakfast at hotels but I did & it was wonderful!! Check in was super easy. The rooms were very clean & spacious. Thank you!! 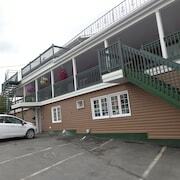 Where to find Edmundston - Grand Falls hotels near an airport? 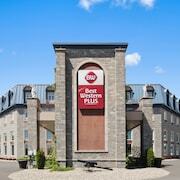 Where can I find hotels in Edmundston - Grand Falls that are near tourist attractions? Unfortunately, our extensive Canada database doesn't list any short-stay or long-stay options in the vicinity of greater Edmundston - Grand Falls. If you need to book accommodation in this part of Canada, Sackville could be a good option. It is 1850 kilometres (1157 miles) away from Edmundston - Grand Falls. 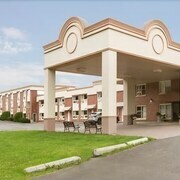 Sackville hotels and apartments include the Coastal Inn Sackville and Marshlands Inn. Places to stay in Edmundston which is around 1550 kilometres (949 miles) away include Comfort Inn Edmundston and Days Inn Edmundston. 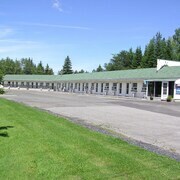 St. Andre, roughly 1600 kilometres (979 miles) from the heart of Edmundston - Grand Falls is home to Quality Inn and Motel Leo. Edmundston - Grand Falls offers just a handful of budget hotel options. 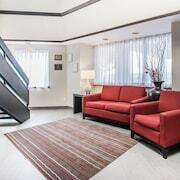 You will find the Days Inn Edmundston located 1550 kilometres (954 miles) from the town center. If you enjoy sports and like to watch local games you might choose to head to Fort William Gardens, which is 40 kilometres (24 miles) to the southwest of Edmundston - Grand Falls. For those who are interested in staying nearby, make a reservation in the Victoria Inn Hotel and Convention Centre Thunder Bay or Days Inn & Suites - Thunder Bay. If you are flying into or out of Thunder Bay International Airport and choose to stay nearby try Valhalla Inn or Comfort Inn. 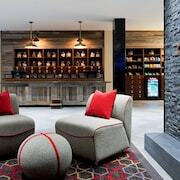 What are the most popular Edmundston - Grand Falls hotels? 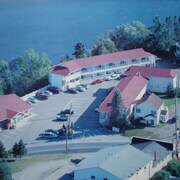 Are there hotels in other cities near Edmundston - Grand Falls? 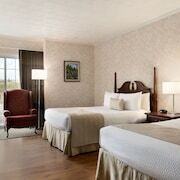 What other types of accommodations are available in Edmundston - Grand Falls? Explore Edmundston - Grand Falls with Expedia.ca’s Travel Guides to find the best flights, cars, holiday packages and more!